CPAP therapy (continuous positive airway pressure therapy) is one of the most common treatments for obstructive sleep apnea a condition that affects four out of every 100 men and two out of every 100 women during their lifetime according to Informed Health Online. 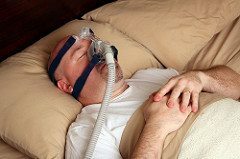 A CPAP machine consists of three basic parts: The compressor or motor creates the pressurized air the hoses deliver the air to the mask and the mask covers the nose and sometimes the mouth. The machine delivers a steady stream of pressurized air through a tightly fitted mask that prevents the airway from narrowing or collapsing. There are many variations of the CPAP mask and compressor. Your local medical equipment store can help you work with your physician to find the style that would best meet your needs. The style of mask size of compressor sound level of the machine and overall comfort are all options you need to consider – and professional guidance can go a long way in making the right decisions. Once you get your machine you’re bound to have questions about how to use it most effectively how to minimize discomfort and whether you need to sleep on your back to use it. Reid Health offers free CPAP clinics led by a qualified respiratory therapist who can answer these questions and empower you to get the most out of your CPAP machine. Getting the right help with your CPAP machine can help with issues like improper fit stuffy nose and any initial difficulty sleeping. With a better understanding of the equipment and how to get it to best work for you you will be able to experience the benefits of a restful night’s sleep. We are currently asking the manager of our Respiratory Care department for some feedback. It may be easier for her to arrange a phone call with you to answer your questions or direct you for further care and advice. We will let you know what we are able to find out!